1st Workshop on Artificial Intelligence for Diabetes (ECAI). 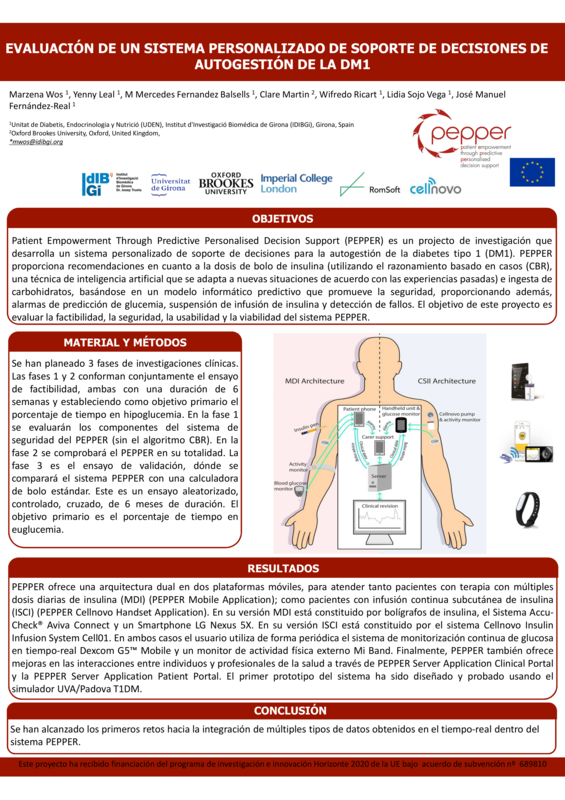 PEPPER: Patient Empowerment Through Predictive Personalised Decision Support. Pau Herrero, Beatriz López , Claire Martin. Handling Missing Phenotype Data with Random Forests for Diabetes Risk Prognosis. Beatriz López, Ramon Viñas, Ferran Torrent-Fontbona, José Manuel Fernández-Real. Interconnection of Medical Data Acquisition Systems. 2016 International Conference and Exposition on Electrical and Power Engineering (EPE). Involving physical activity in insulin recommender systems with the use of wearables. Beatriz López, Alejandro Pozo, Ferran Torrent-Fontbona. 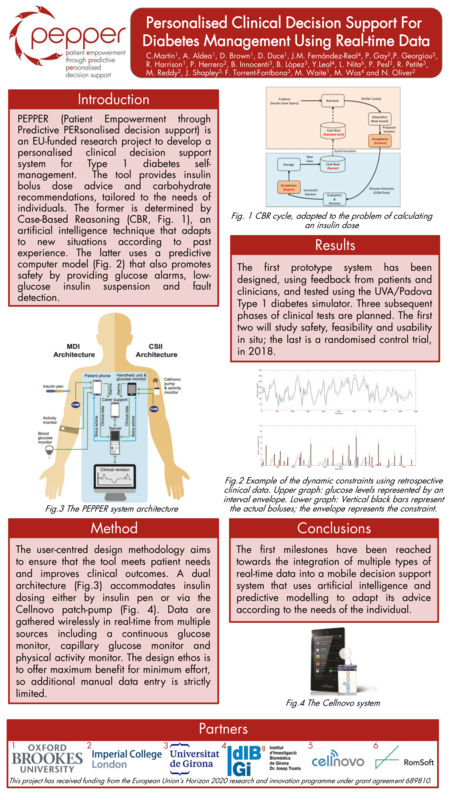 A CBR-based bolus recommender system for type 1 diabetes. Ferran Torrent-Fontbona, Beatriz Lopez, and Alejandro Pozo-Alonso. Negative resuts for the prediction of postprandial hypoglycemias from insulin intakes and carbohydrates: analysis and comparison between real and simulated datasets. Fabien Dubosson, Natalia Mordanyuk, Beatriz López, and Michael Schumacher. Automatic Adjustment of Basal Insulin Infusion Rates in Type 1 Diabetes using Run-to-Run Control and Case-Based Reasoning. Pau Herrero, Peter Pesl, Monika Reddy, Nick Oliver and Pantelis Georgiou. 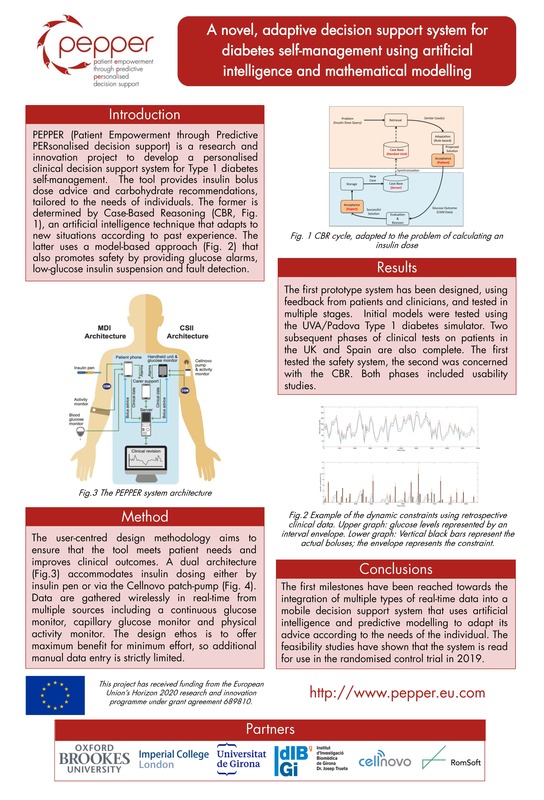 Personalised clinical decision support for diabetes management using real-time data. Clare Martin, Arantza Aldea, Daniel Brown, David Duce, José Manuel Fernández-Real, Pablo Gay, Pantelis Georgiou, R. Harrison, Pau Herrero, Bianca Innocenti, Beatriz López, Yenny Leal, Lucian Nita, Peter Pesl, Roberto Petite, Monika Reddy, Julian Shapley, Ferrant Torrent-Fontbona, Marion Waite, Marzena Wos, Nicholas Oliver. Advanced Technologies & Treatments for Diabetes. Avaluació d'un sistema personalitzat de suport de decisions d'autogestion de la DM1. Marzena Wos, Yenny Leal, Mercé Fernández-Balsells, Clare Martin, Pau Herrero, Beatriz López, Wifredo Ricart, Lidia Sojo-Vega, Eduardo Esteve, Emilio Loshuertos, Julian Shapley, Lucian Nita, José Manuel Fernández-Real. Evaluación de un sistema personalizado de soporte de decisiones de autogestion de la DM1. Marzena Wos, Yenny Leal, Mercé Fernández Balsells, Clare Martin, Wifredo Ricart, Lidia Sojo Vega, José Manuel Fernández-Real. 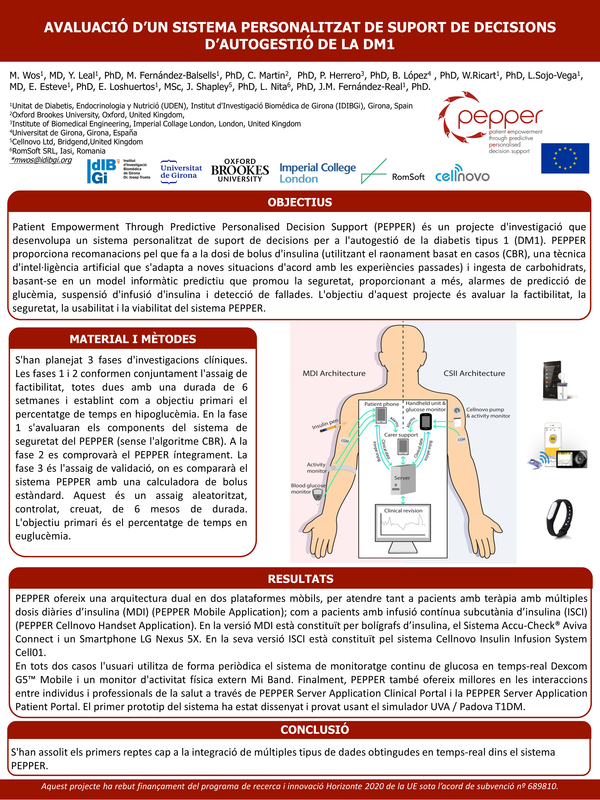 The PEPPER consortium presented de Poster Artificial Intelligence for Diabetes at the Oxford VentureFest2018. It describes the novel adaptive decision support system for diabetes self-management using artificial intelligence and matematical modelling. 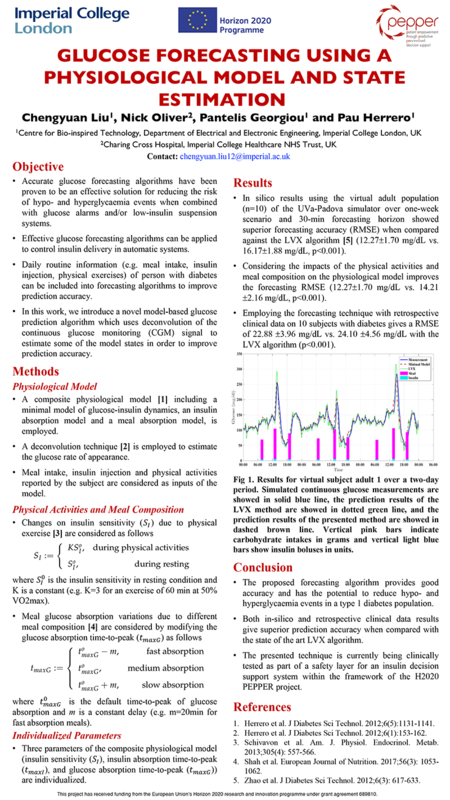 Glucose forecasting using a physiological model and state estimation is the title of the Poster presented to the Advanced technologies and treatments for diabetes (ATTD) in February of 2018 in Vienna, Austria. Nick Oliver, from the Charing cross Hospital, Imperial college Healthcare NHS trust UK. Coordinating low-glucose Insuline suspension and carbohydrate reccommendations for hypoglycemia minimization is the title of the poster presented at the Advanced treatments and technologies for Diabetes (ATTD) this year's conference in Berlin. 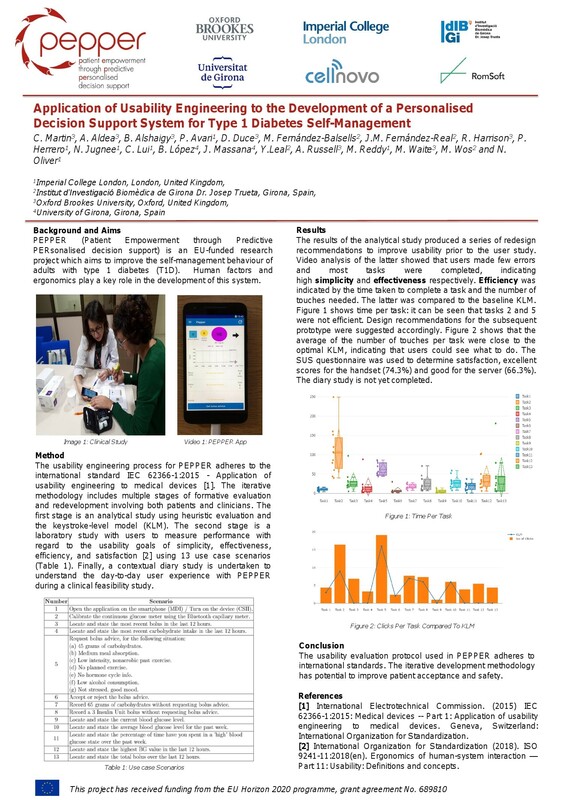 It is a great pleasure to welcome you to the second issue of the Patient Empowerment through Predictive Personalised Decision Support (PEPPER) Project newsletter. The project continues to make exciting progress, with Type 1 diabetes patients recruited to the initial feasibility study which is about to start. This issue includes reports of the two most recent project meetings, in Paris and Iasi respectively. The Paris meeting was co-located with the Advanced Technologies and Treatments for Diabetes conference (ATTD 2017), at which we presented an introduction to our work. The project partners have also been busy fostering a network of interested stakeholders. 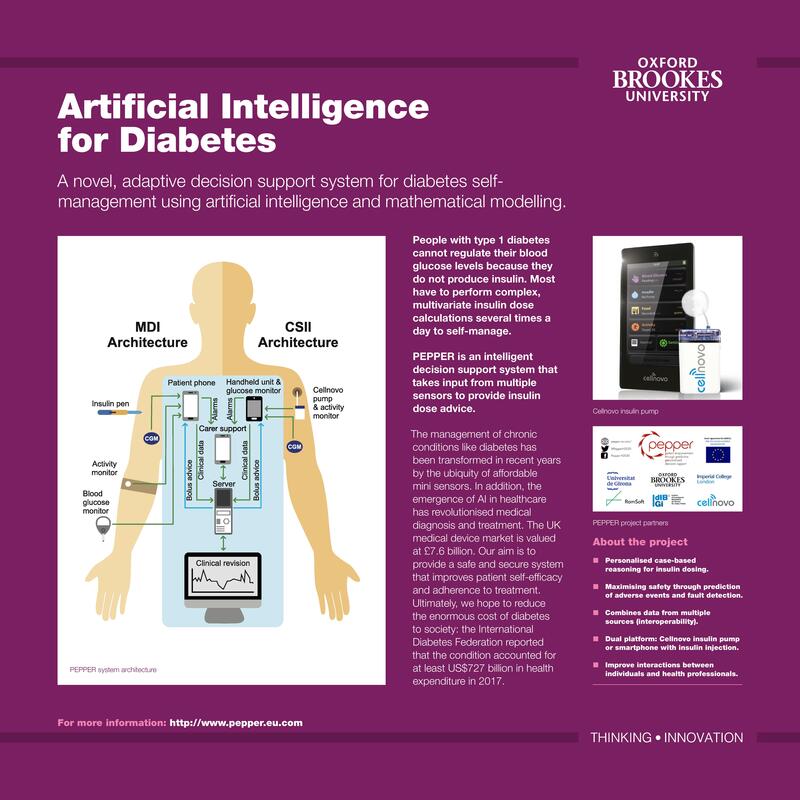 This included organising the Second Workshop on Artificial Intelligence in Diabetes (AID), which took place during the international conference on Artificial Intelligence in Medicine in June, and is described here. I do hope that you enjoy this issue of our newsletter. Do you want to change image ?